Provide comfort for the family of Josephine Napoli with a meaningful gesture of sympathy. 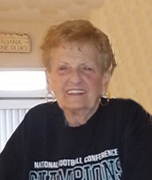 Mrs. Josephine Dolores Napoli (Nee Cutillo) of South Philadelphia on Saturday, February 2, 1019.. She was 85 years of age. A strong and caring woman, Josephine was devoted to her beloved family. Prior to retirement, she was employed as an admissions coordinator for Jefferson Medical College for many years. A long time parishioner of Stella Maris Church, Josephine enjoyed getting involved and being of service there. Dancing, trying her luck at the casinos and spending time with her grandchildren are just a few things that Josephine loved to do. She will be dearly missed by anyone who had the chance to know her. She is the beloved wife of the late Andrew Napoli. Devoted mother of Steven Napoli (Karen Curley), Andrew (Rochelle) Napoli, Millie Napoli, (Dolores Orem) and the late Richard (Surviving wife Trish) Napoli. Loving grandmother of Stephen, Derek, Jeffrey, Kristina, Briana, Zofia and Clifford "Judgy", great grandmother of Joanna, Abigale, Derek, Jeffrey and Justin. Dear sister of John "Sonny" Cutillo, Elaine Birch and the late Angelina Bilotti and Janice Riding. Relative and friends are invited to her Viewing and Funeral Thursday morning 10 A.M. to 10:50 A.M. at Stella Maris Church, 10th and Bigler Sts. Funeral Mass to begin 11 A.M. Interment Holy Cross Cemetery. To send flowers in memory of Josephine Dolores Napoli, please visit our Heartfelt Sympathies Store. Provide comfort for the family of Josephine Dolores Napoli by sending flowers.